Neuroscience Group Field at Fox Cities Stadium will be a No Peanuts Zone for Peanut Free Night on Friday, June 27. 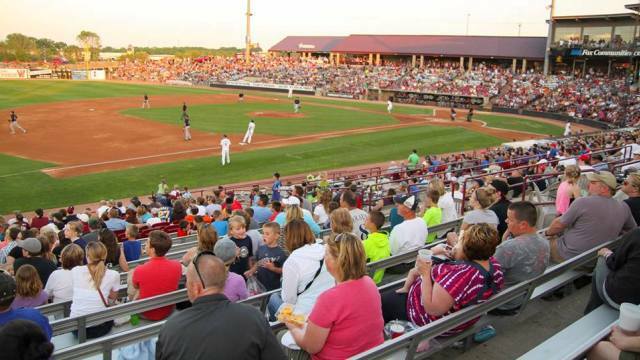 GRAND CHUTE, WI - The Wisconsin Timber Rattlers open the second half of their home schedule on Friday, June 27 with a special night. The Midwest League affiliate of the Milwaukee Brewers hosts the Burlington Bees with their sixth annual Peanut Free Night at Neuroscience Group Field at Fox Cities Stadium. "I know families with children who have peanut allergies," said Timber Rattlers president Rob Zerjav. "They circle this date every year for an opportunity to come out to a game. We are extremely happy to host this game again." The stadium will be cleaned and rinsed before Peanut Free Night to remove as much peanut residue from the seats, the concourse, and other areas in the ballpark as possible. Even though peanuts and products made with nuts or peanut oil will not be sold, the Timber Rattlers cannot guarantee that all peanut residues will be out of the ballpark. However, every effort will be made for a peanut free environment. This game is also North Shore Bank Family Night presented by Y100. Children 12 and under receive a voucher that is good for a free hotdog and soda. Children 14 and under may run the bases courtesy of Molina Healthcare after the postgame fireworks display. Tickets for Peanut Free Night are available online, over the phone at (920) 733-4152 or (800) WI-TIMBER, or in person. The Neuroscience Group Field at Fox Cities Stadium Box Office is open from 9:00 am until 5:00 pm Monday through Friday and Saturdays from 10:00 am to 3:00pm.